Join us to celebrate the Festival of Lights! The JCC of Greater Baltimore and the Gordon Center for Performing Arts are thrilled to present a diverse array of Chanukah fun for all ages to be held throughout the Baltimore City, Baltimore County, and Carroll County communities. From holiday-themed musical performances at the Gordon (Lisa Loeb and the Maccabeats are coming!) to Charm City Tribe’s annual Chanukah Brew Ha Ha for young adults, the community is invited to join in the celebration of this beautiful festival of lights. Join the JCC at Greetings and Readings for Chanukah activities, story time and a special singalong with Chanukah songs. Greetings and Readings will be offering discount coupons to buy last minute holiday gifts. Wegmans will also set up a holiday display so you can prepare for Chanukah parties! Foundry Row will again host the JCC and our partners for a morning of Chanukah activities inside Wegmans. There will be dreidel spinning, storytime, edible crafts and music for kids of all ages. In gratitude for your membership we are offering eight opportunities to receive a J gift. The more days you visit the J, the more chances you have to win! Tickets available at the Welcome Desk. One per member, per day. Shabbat Chanukah drawing will be pulled on Sunday December 9. Every time you visit the J during these days, you can enter to win a half-hour Personal Training Sessions with the Trainer of your choice*. Owings Mills will select 20 winners. Park Heights will select 18 winners. *Must be a JCC member to win. Limit one entry per day. Charm City Tribe celebrates with its annual Chanukah Brew Ha Ha at the new Union Collective this year. An event for young adults ages 22-39. Join us for an interactive program with J Science, engaging children in the fascinating world of STEAM with Jewish ideas, values and stories! Learn about the Science of Light and Motion with a host of experiments related to themes and messages of Chanukah. Ideal for ages 4-12. 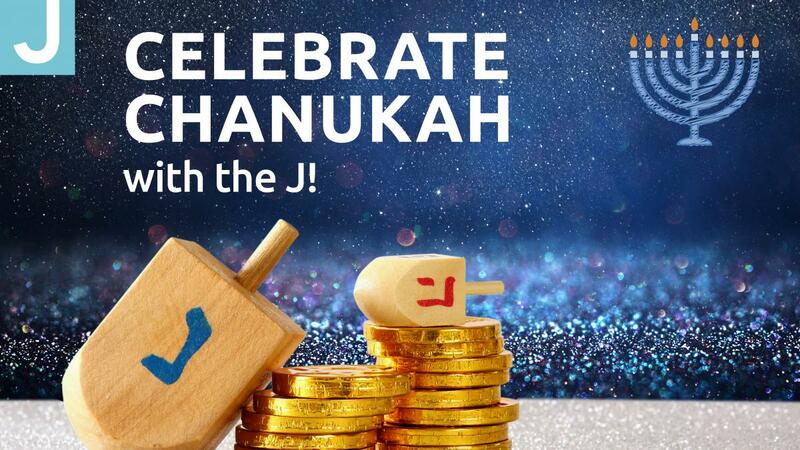 Celebrate Chanukah at the J with fun-filled activities for the entire family! With Olive Press Demonstration, Donut Decorating, Chanukah Arts & Crafts, Moon Bounce, Face Painting, Chanukah Photo Booth, Food for Purchase. A partnership between the JCC of Greater Baltimore and Chabad of Park Heights.